In 1930, the Philadelphia Athletics won 102 games en route to winning the World Series over the St. Louis Cardinals. Al Simmons led all AL batters with a .381 batting average, following oh-so-closely by Lou Gehrig at .379. Gehrig finished second in Home Runs and Slugging Percentage to his teammate, Babe Ruth and second in hits with 220 to Johnny Hodapp. Lou Gehrig did lead the league in one very important category: RBI. But Yankee bats couldn’t carry them to a championship as the A’s had offense, defense and pitching. Philly starter Lefty Grove won an astounding 28 games and he led the league in ERA with a 2.54 — almost a full run lower than the 2nd place guy (3.31). Also, it can’t go without mention that George Earnshaw was a huge part of that rotation, tossing a mind-blowing 296 innings. Al Simmons and Jimmy Fox powered the A’s lineup all the way to a world championship. 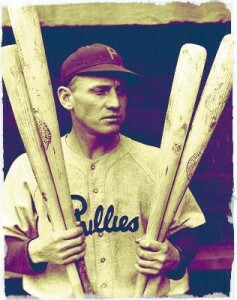 1930 marked the last time a National League player batted over .400 when Bill Terry of the New York Giants batted .401. He also had a ridiculous 254 hits that year. Chuck Klein had an unbelievable year with the last-place Phillies. He batted .386, hit 40 HRs, 59 Doubles, 250 Hits, 158 runs scored and 170 RBI. Statistically, that stands as one of the best seasons of all time, but Klein is far from a household name. In 1930, every player on the Cardinals roster with more than 300 ABs had a .300+ batting average. That’s the only time in history that has ever happened. And THAT will win you an NL pennant.